This soluble powder form saccharide product is from the natural factors extracted from specially selected high quality non-genetically modified soybeans. It promotes the proliferation of "Bifidobacterium" in the human intestines and promotes the proliferation of Bifidobacterium, regulates the proportion of intestinal flora, retards ageing and disintegrates and disposes carcinogens. At the same time its assist in reducing blood pressure, cholesterol and protects the liver. 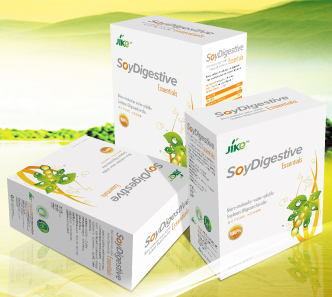 The rate of proliferation of bifidobacteria using Jike’s SoyDigestive is 3 times more than common oligosaccharides. A Healthy body must begin from the "intestines"
This product is from the natural factors extracted from specially selected high quality non-genetically modified soybeans. Soybean oligosaccharide comprises of Raffinose and Stachyose. It is mainly digested and absorbed by "Bifidobacterium" in the human intestines and promotes the proliferation of Bifidobacterium, regulates the proportion of intestinal flora and guards the human body against harmful bacteria. Taking Soy Oligosaccharides will rapidly increase the growth of beneficial bacteria in the human body and will form the majority in "bacterial community". Experiments show that after taking 10-15 grams of Soy Oligosaccharides everyday for 17 days, the bifidobacteria increased from 0.99% to 45%., and the proliferation of bifidobacteria is 3 times more than common oligosaccharides. Those who have Constipation and those whose intestinal dysfunction caused by side effects of laxatives. Those with leading irregular lifestyle. Those who with insufficient intake of water and vegetables. Those with Diabetes, hyperlipidemia and hypertension. Those who often entertains, drinks alcohol and have fatty liver. Those who needs to detoxify, be beauty and wants to lose weight. Those who have melasma, acne and bad breath.